It must have been somewhere in the mid eighthies. It was a Thursday evening and like every Thursday evening I was listening to my favorite radio show. Two hours of new progressive rock and oldies from the seventies. On that particular evening the dj said that he was going to play something from a band named Gryphon. A band that had toured with Yes in 1974/75. And then without any warning he played two tracks from Red Queen to Gryphon Three, Lament and Second Spasm. After those two tracks I was speechless. I could here the dj say "I don’t know if this was beautiful, but at least it was unique". Not beautiful!!?? I thought it was incredibly beautiful. 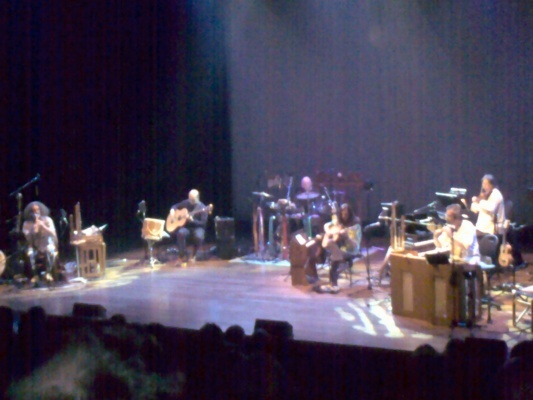 That mix of medieval music and rock/folk music was something I had never heard before. Luckily I always taped those radioshows because I spent the next ten years finding the album (and Midnight Mushrumps). By the end of 2008 I bought the excellent second solo album from Martin Orford (who was in the audience as were some members of Norways Wobbler) “The old Road” and there I saw the name of David Oberlé and I thought “didn’t he used to be in.....? ?Yes in Gryphon. And that again triggered my interest in finding out what had happened to the other other band members. And there it was on their website, the announcement of a one off reunion show in the Queen Elizabeth Hall in London on June the 6th 2009, playing songs from their first two albums Gryphon and Midnight Mushrumps. So me and my girlfriend booked two tickets for the concert. This hall, near Waterloo Station, looks like an unattractive bunker from the outside, but inside was a very beautiful venue that had a capacity of about a thousand seats and it was packed. The crowd was very diverse with more than a reasonable amount of young people. At a little after 19.30 hour the four founding members of Gryphon entered the stage. After 28 years Gryphon and their audience were reunited again. And both would contribute greatly to make this evening a memorable one. They started the concert with the first three tracks of their debut album Gryphon. It was immediately apparent that the band was in great form, they made it all look so easy. During the concert Brian Gulland had joked that they only had been practising a couple of times as “this is very easy music to play”. Graeme Taylor’s guitar playing was beautiful. Third track, Touch and Go, saw him take center stage. Brian Gulland sat like a king on his chair changing from Bassoon to Crumhorn and from recorder to flute. He only had some difficulties when it came to his vocal duties. David Oberlé had no difficulty with his vocals at all. He still has a crystal clear voice. And his subtle drumming was as versatile as ever. And then there was Richard Harvey; still the fastest recorder player on the planet. In some songs playing percussion with one hand and recorder, Crumhorn or keyboards with the other hand. In preparation for this concert the band expressed that they would need all the help they could get and that they got more and more nervous coming closer to performance day. I could not see any nerves. Right from the start they seemed to have so much fun. But they did get help. First there was Jon Davie on bass and percussion. He played on the bands last album Treason from 1977. Secondly there was Graham Preskett on violin, keyboards, mandolin, guitar and percussion. And finally there was help from the audience. They greeted the band with great enthusiasm. During the songs they were very quiet (which is getting rare during concerts these days). But after each song the hall exploded with applause and cheering. The first surprise was the performance of Juniper Suite. They never had been able to play this song live but with the help of the two guests they played the track for the first time live. But there were more surprises. They played two excellent tracks that I had never heard before. First there was a track called Three dances from Susato. If I understood Ricard Harvey correctly this was music from Belgian composer Tieleman Susato who lived from 1510-1570. And there was a track called Ashes. In between these two tracks the band played the incredibly beautiful 19 minute Midnight Musrumps. What a song! And the audience treated the band to yet another well deserved standing ovation. The last surprise during the concert came during the encores. Gulland and Taylor had arranged a medley from the tracks of Red Queen to Gryphon Three. The album I had searched for so long was now played live. Goosebumps and tears in my eyes! I’d like to mention one more thing that happened during the show. When the band decided to do this concert they asked Gulland to grow his "wild mans" beard again. And Gulland agreed reluctantly and on one condition. And that one condition became clear when a girl entered the stage with a bucket of water and a razor freeing Gulland from his beard just before the last encore to great amusement of both audience and band members. All in all this reunion concert was a complete triumph. The band seemed to be thrilled and surprised by the enormous enthusiasm of their audience. It was great to see that after 28 years so many people had not forgotten this great band. A unique band in the history of progressive rock. And maybe, just maybe the band was so enthusiastic after the show that they are going to write, record and release new music again. One can only hope.